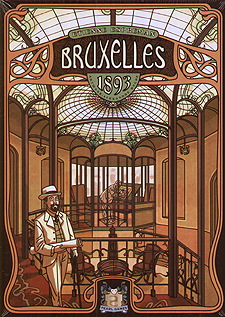 Brussels 1893 Victor Horta builds Autrique House and Tassel House, recognized as the first "Art Nouveau" buildings, where the fluidity of spaces echoes curvilinear botanical forms, incorporating ironwork, mosaics, frescos, and stained glass windows. The same year, Paul Hankar erects his own house. The Belgian capital became the birthplace of this innovative movement that would make an impression on all of Europe, and impact the greatest architects of the Belle Epoque. In this exciting strategy game, with cleverly combined worker placement and auctions, you represent one of these celebrated architects who make Art Nouveau famous in the Belgian capital. Your assistants help you perform actions such as construction of Art Nouveau buildings, or creating the works of art that decorate these beautiful homes. It is also possible to develop your reputation as an architect, increase your influence at the Royal Palace or the City Hall, and even benefit from Public Figures that you encounter during your theatre outings. The most clever architect will win the game.